Historically women lived in a world of texture; silky fiber as they spun and wove clothes, feathers and slippery intestines as they prepared food, rough and heavy rocks as they tended the homestead garden. Today, with our computers, virtual world and time spent in the office, then car, this world of texture and response is lost to another time. 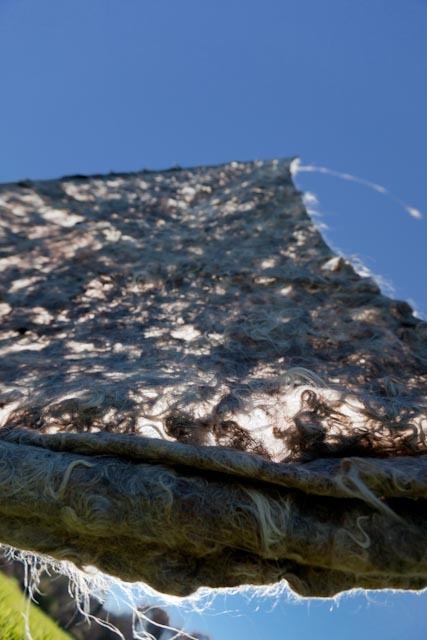 The process that I undertook to make these felted wool sails was initiated by the touch of raw wool, lanolin covering my hands and soon my arms. My studio in Western Massachusetts filled with the comforting animal smell of sheep as I collected wool for three years from surrounding homestead farms. For this project I wanted to capture the essence of New England reflecting on its sailing and sheep farm beginnings. Some essential components were important for this piece: One is that the main materials came from local farms and businesses. 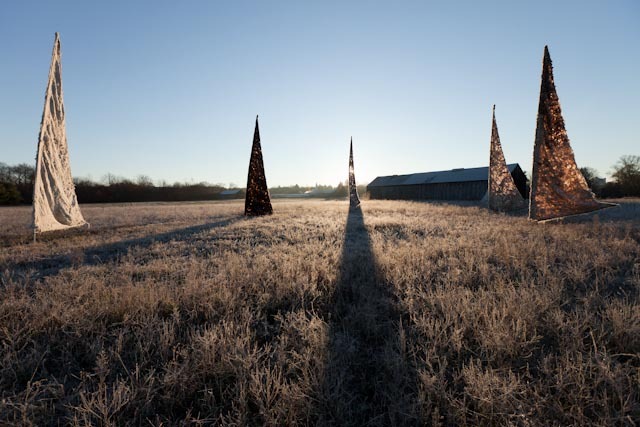 Another, is that the process of making the sculpture mirrors the daily work of the New England farmer, and in the end, the upkeep of the sculpture reflects the constant fight of a farm against economic, cultural, and environmental factors. On the first night that I met my husband he gallantly asked me to sail around the world with him. Five years later we sailed for our honeymoon. Imagine if you can, the symbolism of that trip; We lived on a small boat, working, communicating (or not), learning instantly how the other handles situations out of the ordinary and in cramped conditions. This was immeasurable preparation for our family life together. Soon we raised our children on the coast of Rhode Island, taking them sailing individually on windless days as they leaned over and dragged their hands through the water. Now, in Amherst, you could say we are landlocked. My heart sails over rolling hills, beautiful fields and quiet bays of the valley. Visually I consider the sail a beautiful shape and form. Though flat and angular, a sail can instantly billow into life, pregnant with possibilities. The filled curves alludes to mass that is not there. I like to imagine Pleiades, sailing on the geological Lake Hitchcock that covered the Pioneer Valley during the glacial era. During an after-college trip working on a sheep farm for my room and board in Wales, then much later, as I worked on an educational farm in Hadley, I observed that sheep and sails behave similarly. When disturbed or arriving for their dinner grain, a flock of sheep moves together facing the same way. Comparably, a fleet of sailboats in a race or anchored at harbor, will all face and move the same way. Combining the wool of sheep in the shape of the sail was a fitting way to express this parallel behavior. The title of Pleiades comes from the celestial name of a cluster of seven stars nicknamed the seven sisters or the sailing ones. 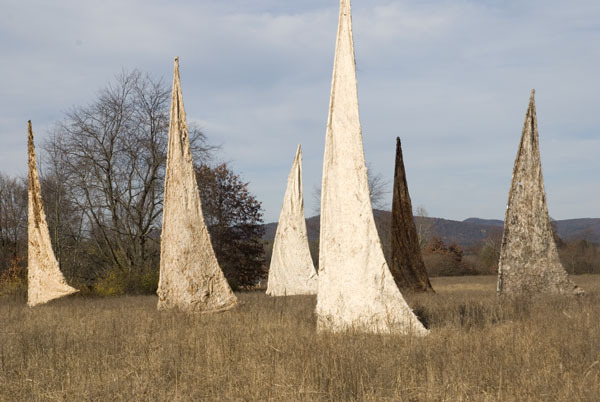 I placed the sails in a field near the Holyoke range whose nickname “seven sisters” refers to the seven bumps or “waves” of the range. The predominant wind in the valley, southwest, directs the landlockedsheep/sails toward the range. 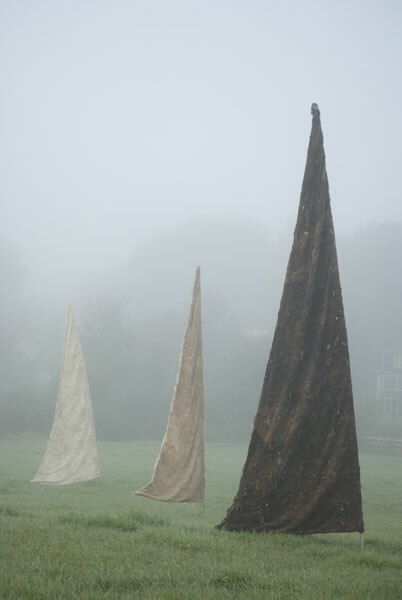 These sails are light and airy, felted with the intention to let the wind blow through. 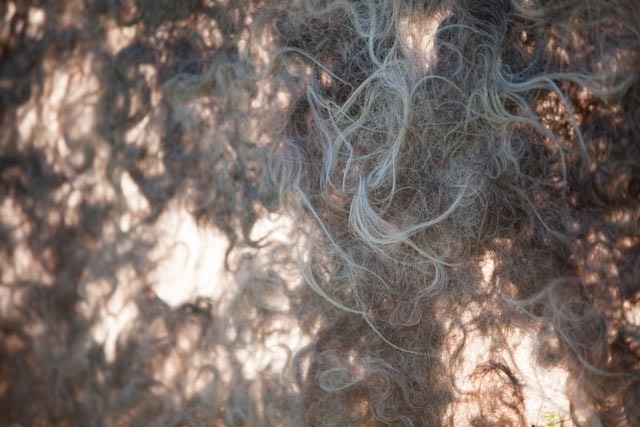 The result also allows the sun to filter through, emphasizing the curls and individual locks of different sheep breeds. If you look carefully you will still find hay tangled in the sail. 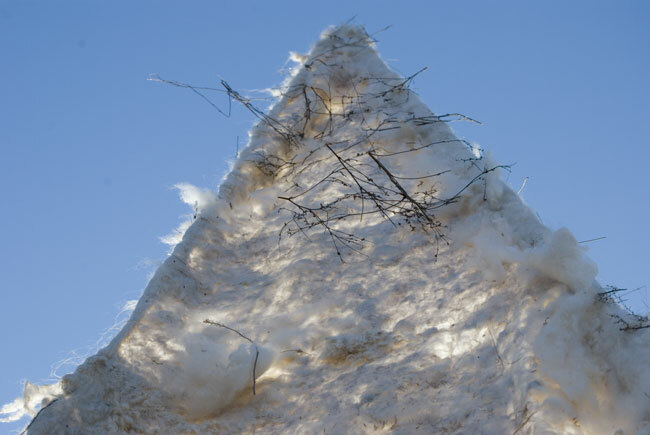 The natural lanolin sheds water when it rains, however the sails are not immune to destruction from the elements. Wind on any sailing day is a friend. 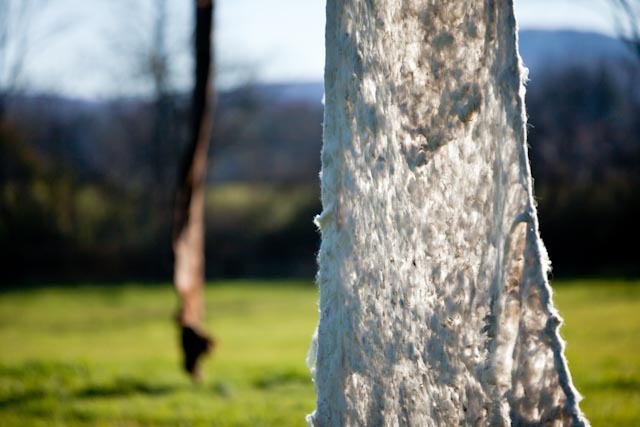 But when felting, wind became my foe. On any reasonably warm day I would felt outside, the space allowing me to spread out the twenty foot sails. A gentle puff would send carefully placed wool into the wind. I employed the method of wet felting and settled on the traditional Mongolian process of creating felt for yurts by rolling the felt behind a horse, but in this case, it was my car. As I opened bags of wool and pulled out their contents, a small note would fall out in the farmer’s handwriting with the name of the sheep whose wool was sheared. Althea, Gus and Dostoevsky, are a few of the sheep whose fleece I came to know. As the sails react to the wind, rain and snow their constant change reflects the transforming landscape of the New England farm. 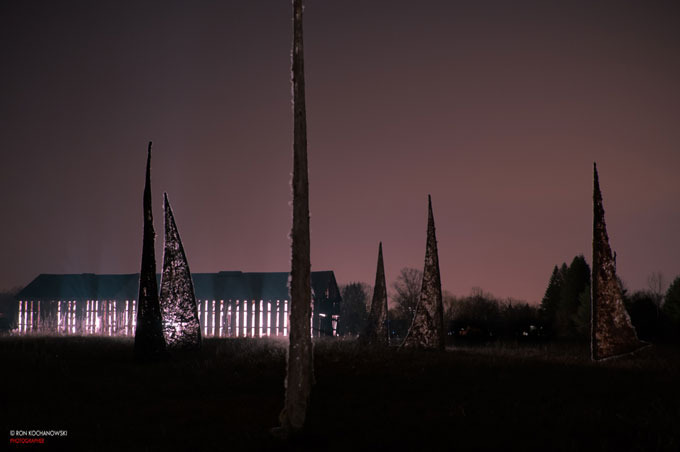 While the installation is up I repair natures alterations, in a sense, an artist mirroring the endless work of the farmer whose land the sculpture sails.